Happy Hallowe’en folks! Two weeks ago we announced a competition for three of you loyal readers to win a DVD copy of portmanteau sequel V/H/S/2, courtesy of Koch Media and Fetch Publicity. The winners are Marcus Cunningham, Sarah-Louise Bailey and Mandy Richcliff. Congratulations to all of the winners! 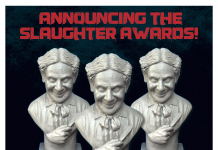 The winners can expect your DVDs in the post in the next ten days. 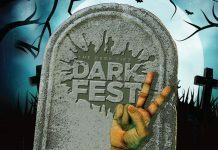 If you have not received your prize by then, please get in touch with us at the same email address as before, competitions@thedarksidemagazine.com. 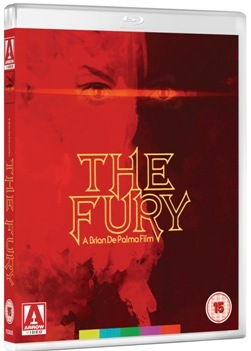 One of De Palma’s best loved films, Arrow’s version of The Fury has been painstakingly restored from the original camera negative, a process overseen by master technician James White (who also restored the acclaimed AV release of Zombie Flesh Eaters). Marking the film’s UK Blu-ray premiere in style, Arrow’s team of restorers have breathed new life into this telekinetic masterpiece – it’s crystal clear, vibrant and has been newly graded, all the while keeping true to Richard H. Kline’s brilliant original cinematography. 2013 marks The Fury’s 35th birthday… it’s never looked better. Unappreciated on its original release, except by a few including the great Pauline Kael, Brian DePalma’s adaptation of John Farris’ novel The Fury is a time-capsule of techniques and styles that for this kind of film have changed so very much since. Kirk Douglas plays Peter Sanza, a Bourne-esque U.S. intelligence agent double-crossed by friend and fellow agent John Cassavetes, who secrets away young Robin Sandza (Andrew Stevens) who is possessed of extreme telepathic and telekinetic abilities. Meanwhile teenager Gillian (Amy Irving) finds herself possessed of growing abilities as well, and in joining specialised institute the Paragon Clinic becomes mentally linked to Robin…. Most writers place this in the context of DePalma’s previous film, the hugely influential Stephen Kin adaptation Carrie, given it is als about teenage psychics. 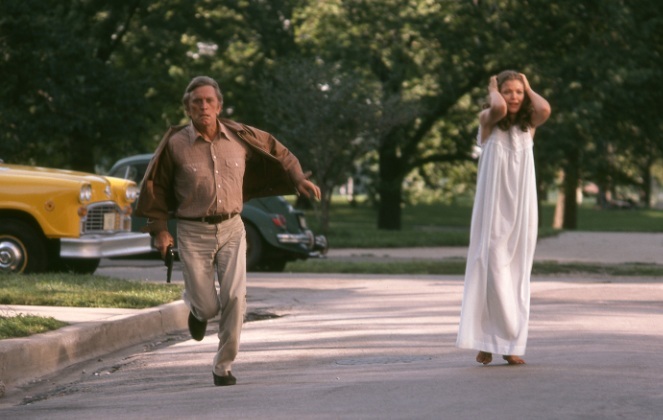 Others connect it to both earlier examples of 70s post-Watergate paranoid thrillers, and later ones like DePalma’s own Blow Out. Still more look at it as a metaphor for what effects-driven blockbusters would do to American independent films, with two giants of the latter as the leads duelling each other for the youth of “today”. The fact is, the film is all of these at once: a sci-fi espionage thriller with horror overtones, possessed of a nice sense of paranoia and drama often pitched at operatic levels, leavened with a humour the Bourne films never had time for, and occasionally reflective of larger concerns. The opening terrorist attack on a Middle Eastern resort (shot on location in Israel) is the kind of big, loud action sequence that is now a staple of blockbuster cinema around the world, while the themes throughout the film contain both the paranoia of the times but also generational anxieties typical of popular art after the invention of the teenager. The Chicago sequences balance comedy and thriller in way that connects the world of the viewer with the world of government and corporate medical conspiracies. Behind the ordinary world lie hidden dangers that can cost innocent people their lives – something that resonates now as much as it did then, if not more so, with the scale of modern terrorism, government indifference to civilian collateral, and big pharma scandals that only serve to shore up public paranoia. We are clearly living in the world The Fury posits. The acting can seem stilted at times, the music sometimes overbearing, but both do what they’re meant to do within the film, and make the really subtle work stand out more. 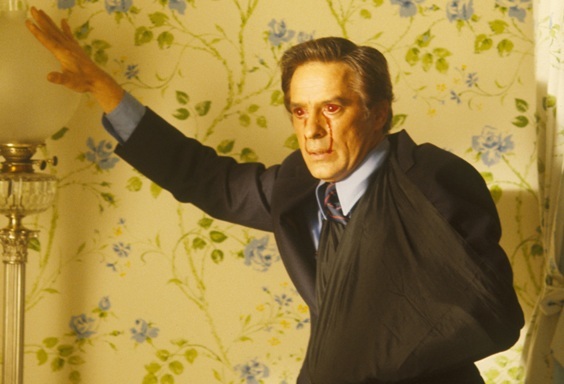 Douglas and Cassavetes do great, subtle work, with Douglas switching moods on a dime, compartmentalisation personified (he makes one realise the dimensions missing from Kiefer Sutherland’s Jack Bauer) and Cassvetes positively satanic as the government spook weaponising children. Of the youngsters, Irving is much better than Stevens, with the final scene allowing her to finally release much of the pent-up energy her earlier performances required to be kept back, but both do OK with what they have – certainly more interesting than your average equivalent today (who admittedly would be propping up a CW TV show rather than appearing in a teen psychic thriller). Reliable faces pop up throughout, some repertory players for DePalma but others familiar faces to genre fans: Carrie Snodgress, Fiona Lewis, Charles Durning, Rutanya Alda, Dennis Franz (making his debut!) and J. Patrick Macnamara. Franz is not the only fresh face to be spotted; watch out for Daryl Hannah, Laura Innes and Jim Belushi. It’s a very Chicago kind of cast. This transfer is nothing short of astonishing. Just when you think you are used to what can be achieved with sympathetic restoration, mastering and authoring, along comes a film like this one full of elements difficult for digital compression to handle, and blows you away. It’s nigh on impossible to believe the film looked this good in theatres even – it’s as if we have been privileged to seeing the very first print off the negative produced with the very best tools and techniques available. Colours, textures, details, contrast are first-class throughout. Moving water, artificial fog and smoke, night-time filming, all look superb barring maybe one shot of each here and there. This is sublime, on a par with if not better than last week’s restored release of Halloween, also 35 years old. Audio is also impressive. The 4.0 mix balances out dialogue, effects and John William’s atypical score to good effect, reversing the trend of modern soundtracks where the effects overwhelm all. William’s lush score is also available on an isolated track, and is well worth sampling, especially if one is not a fan of his typical work. Arrow continues to do justice to DePalma’s earlier work, once again packing the disc with substantial, relevant featurettes that contextualise the work thoroughly. Solid, newly-shot interviews with ace cinematographer Richard H. Kline, actress Fiona Lewis, and then-intern Sam Irvin (subsequently a producer for DePalma and others, a director and a journalist for legendary U.S. genre mag Cinefantastique) sit alongside period interviews of DePalma, producer Frank Yablans, and actresses Carrie Snodgress and Amy Irving – the quality on these is not great, particularly the sound, but all can be made out, just about. The modern ones have the length to give great insight, while the period ones still manage to reveal at least one thing worth knowing about the production in each. Irvin’s DePalma-esque short Double Negative actually gets an outing, and is actually a decent little tale. A rather fast-moving gallery and the trailer complete the on-disc package. The booklet adds yet more depth and insight, with two pieces from academic author Chris Dumas (one on Cassavetes, one a modern interview with writer John Farris) and a period interview with DePalma, as well as liner notes for the short and credits for the release as a whole. 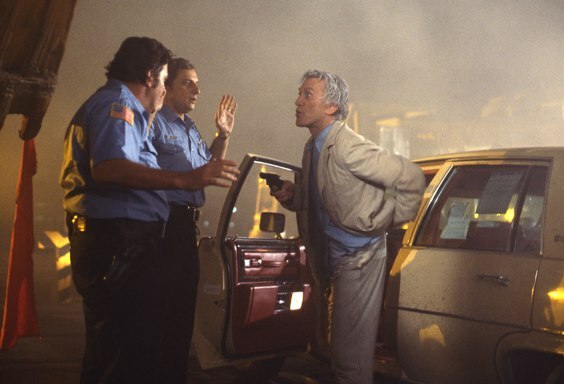 This is the kind of genre piece that has since ascended into blockbuster territory, and while it certainly had an A-list presentation here – Douglas & Cassavetes alone mark that out, but the extensive location, stunt and effects work also bear testament – it is very hard to imagine modern or younger audiences responding to the film as it is. For those who understand what’s at work here, this is a film to be celebrated, different from the norm then and now, packed full of interesting ideas presented in often arresting visual fashion. It would make a perfect double-bill with David Cronenberg’s Scanners, and makes one weep at the thought of what DePalma & Farris’ version of Alfred Bester’s terrific SF novel The Demolished Man would have looked like. Arrow’s blu-ray seems highly unlikely to be bettered, and is the single best presentation of the film out there right now, whether to watch for the first time or to own alongside the rest of Arrow’s superlative library of DePalma releases.